Play the Elfabet Game. It’s a complimentary park-wide scavenger hunt featuring Elves from A to Z. 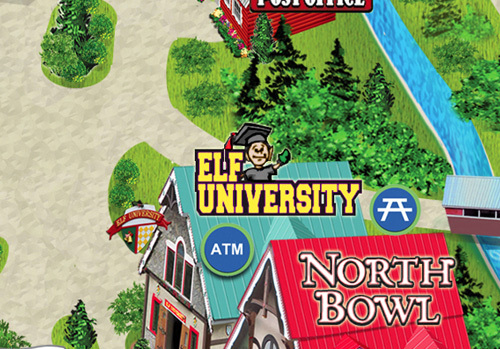 Right after entering the park, go to Elf University located near the entrance, just after the North Bowl. There, you will receive an Elfabet Card with all the letters of the Elfabet on it. Children will want to find all (or most) of the 26 Elves located throughout the park. Simply slide the card into the gift that each Elf is holding, and press down the lever. Each Elf cancels one letter. There will be a special prize for children who pass in their cards—along with a diploma!